AzhwAr says that emperumAn, who protects all, stays in places such as thiruppARkadal (milky ocean) only in order to take shelter inside the hearts of those who do not avoid him. AzhwAr tells his heart to make a note of this. AzhwAr’s divine mind was scared that great people in the world are bewildered into believing that chEthanas (sentient entities) who are like themselves are Isvaras (emperumAn). AzhwAr says that even if one were to tie a rope around one’s neck in order to kill himself, there is an entity who is there to cut the rope and to protect us. uLan kaNdAy – Oh heart! You have seen that he is our refuge on the day that we surrendered to him. In mahAbhAratham uththara kANdam 83, dhraupadhi says “sAham kESagraham prApthA thvayi jIvathyapi prabhO” (Oh emperumAn! Even when you were existing, I was dragged by my hair by enemies). My swAmy, when you are there, my enemies have the courage to touch my hair! Can one connect your existence and the insult that happened to me? Were you like me a woman or were you not a purushOththama (best among all entities) for me to suffer like this! AzhwAr says that he is not saying a non-existing person as uLan (exists). He is there to protect us when we destroy ourselves. His existence is to save us and our existence is to destroy ourselves. Our carrying out prapaththi (surrender) is not due to our fear of others but due to fear of ourselves. It is similar to someone telling an intelligent person “I would myself tie a rope, unknown to me, around my neck in order to kill myself. At that time, you should cut the rope and save me”. Our carrying out surrendering is like this only. nan nenjE – Oh heart! you are present to tell me appropriately that emperumAn is there. You are capable of explaining the meanings of these words to me! uththaman – magnanimous person. In other words, he does favours to others in order to benefit himself. Hence he exists in order to protect us and does that to benefit himself. thaiththiriya upanishath Anandhavalli 6 says “asannEva sa bhavathi asath brahmEthi vEdha chEth” (a person does not exist if he does not have knowledge about brahmam (supreme being)) along with “asthi brahmEthi chEth vEdha santhamEnam thathO vidhu:” (if he has knowledge about brahmam others know that he exists). emperumAn exists without any distinction between these two types of entities (one who does not know him and one who knows him). uLLuvAr uLLaththu uLan kaNdAy – if one day chEthana (sentient entity) believes that emperumAn exists, then emperumAn will exist forever for him. He will reside inside the heart of the one that he wants to pervade, not knowing how to leave that person’s heart and be there forever. veLlaththil uLLAnum vEngadaththu mEyAnum uLLaththil uLLAn enRu Or – Think that the one who is reclining in milky ocean and who is standing in thiruvEngadam (thirumalai) is in our heart. 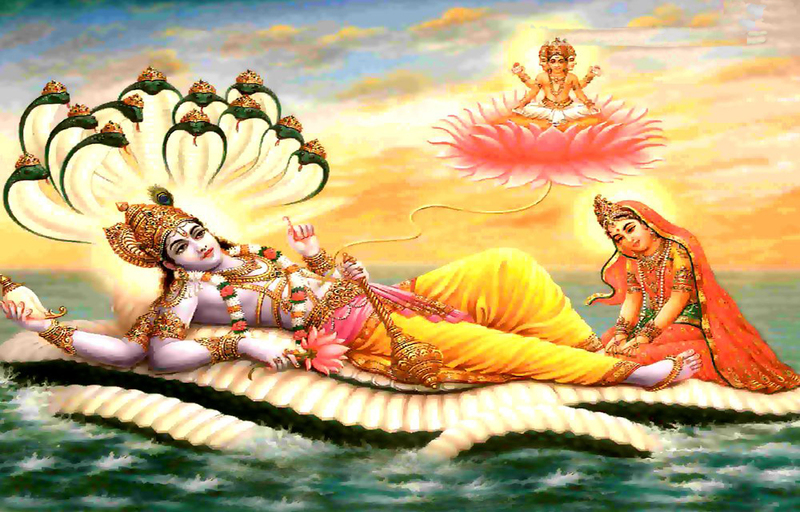 He resides in those places (milky ocean and thiruvEngadam) only to enter our heart. Think that the place that he desires is only our heart. Haven’t thirumazhisai AzhwAr in nAnmugan thiruvandhAdhi 36 “aNaippAr karuththanAvAn” (he is there only to enter the hearts of his followers) and periyAzhwAr in periyAzhwAr thirumozhi 4-5-10 “idavagaigal igazhndhittu enpAl idavagai koNdanaiyE”(leaving aside your dwelling places [such as SrIvaikuNtam, thiruppARkadal etc], you have decided to dwell in my heart! [what a motherly affection is this!]) divinely mentioned the same! We shall consider the 100 pAsuram next. This entry was posted in iyaRpA, mudhal thiruvandhAdhi on September 20, 2017 by T N Krishnan.